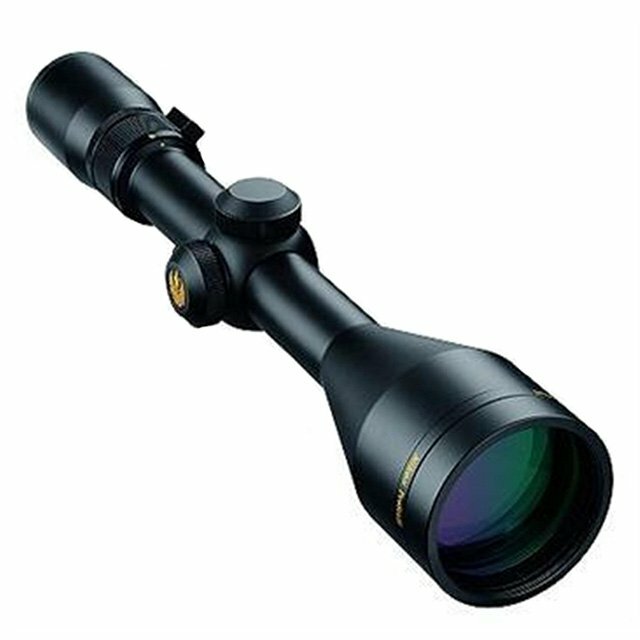 Nikon has had a very successful run with their caliber specific entries - and that is to be expected, given how convenient it is to be able to find a rifle scope that is a great (if not perfect), match for your weapon and ammunition. As a newcomer, I had to go through two or three scopes before I could settle on one for my SR-762. Not so today though, because Nikon has added another caliber matched entry - the Nikon 4-16x42 M308 geared towards the 7.62 NATO / .308 Win caliber. 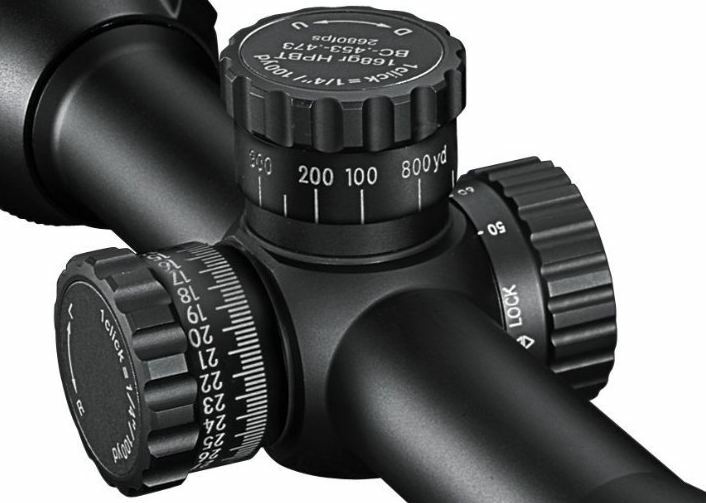 I’ve written up this Nikon 4-16x42 m308 rifle scope review to introduce you to, what is in my opinion, an excellent specialized optical solution for .308 WIN caliber rifles. 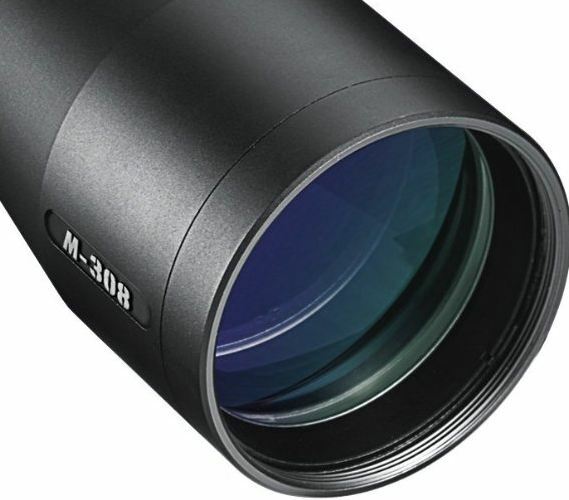 The M308 rifle scope from Nikon is a (relatively) affordable offering which caters to the needs of AR style rifle owners, in particular, those with guns that use 7.62 NATO or .308 WIN bullets. It derives its optical capabilities from the Monarch line from Nikon, with additional specialized features thrown in: tactical turrets, parallax adjustment, a reticle that can be used to compensate for the bullet drop from a 168 gr HPBT match 7.62 x51 NATO/.308 WIN round at 2680 fps, and so on. Customized turret calibration according .308 WIN caliber. Choice between BDC and NikoPlex reticles. Sturdy one-piece main tube construction. Support for Nikon “Spot-On” Ballistic Match Technology. Excellent light transmission in varied conditions. Accompanying custom M308 mount with built-in 20 MOA elevation adjustment. The M308, with its Ultra ClearCoat® Optical system, and fully multi-coated optics, guarantees as much as 95 percent light transmission. This means you’ll be able to get a clear picture from dusk to dawn, and even in relatively cloudy weather. 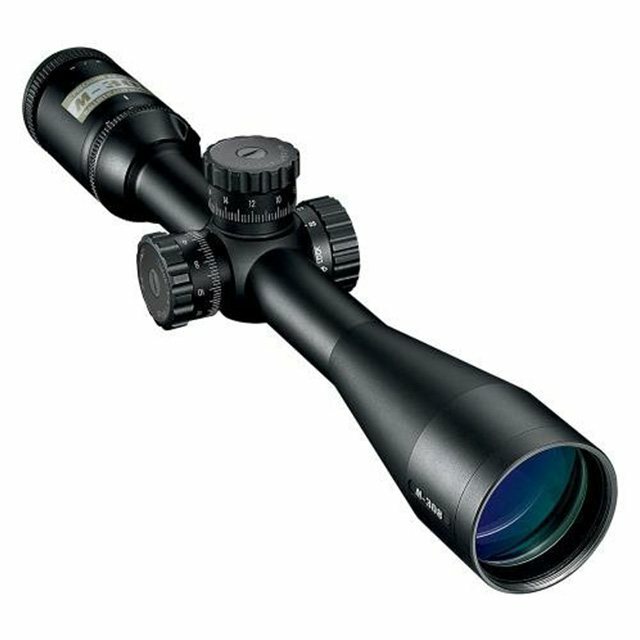 The scope has a 42mm lens diameter, which translates into a 2.6mm (42mm/16) to 10.5mm (42mm/4) exit pupil diameter range. 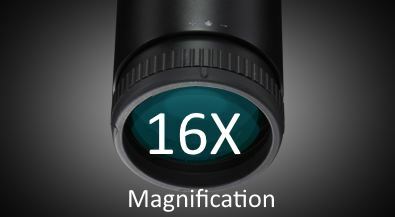 While 16x maximum limit for magnification on this scope is more than enough to push a 7.62 NATO bullet to its limit down range, for the clearest picture, you’ll want to 4x to 8x magnifications, so you’ve got a reasonably large exit pupil diameter to allow for a healthy amount of light to reach your eye. 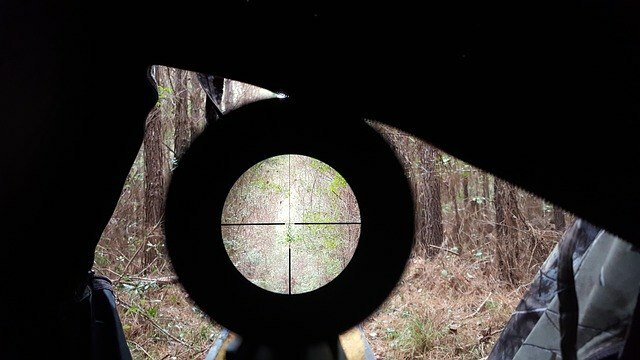 The Bullet Drop Compensation reticle incorporated into this scope is effective up to an 800 yard range, with dots, hash marks and circles indicating holdover points up to that distance. 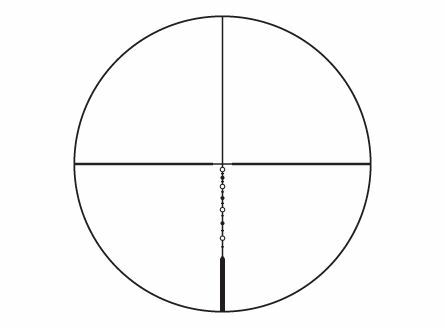 The default subtension settings on the BDC 800 reticle are calibrated for 168gr Hollow Point Boat Tail ammo at a velocity of 2680feet/second. Thanks to the ‘Spot On’ Program though, you can acquire subtension numbers for almost any type of bullet / speed. Nikon’s Ballistic Match program works through a smartphone app on which you enter various data pertaining to your weapon and bullet, such as the barrel length, distance to target, bullet caliber and so on, and it returns the optimum configuration settings for your situation in a very intuitive manner. Sure, it requires patience, but it rewards this with an almost perfect shot on target every time! If you’re not comfortable with the holdover mechanism employed by the BDC reticle, you could opt for a straightforward duplex reticle version (called the NikoPlex reticle), which you can use in conjunction with Rapid Action Turrets that have been specifically marked by distance for .308 bullets. This would make the process of zeroing in pretty easy: just estimate the distance to target (or use a rangefinder), spin the elevation turret to the distance you’ve just estimated, aim at your target and send the shot. The 1/4 MOA tactical style turrets present on the BDC 800 model let you zero in after sighting simply by pulling out the turret knob and rotating its dial to 0. In the case of the Nikoplex version, you’d be dialing it back to the 100 yard mark. 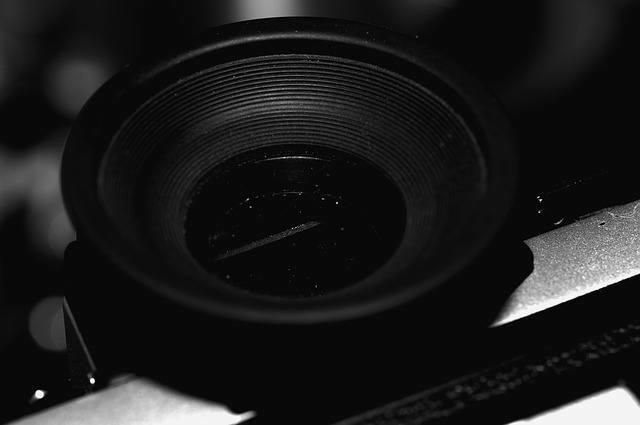 You can also adjust for parallax thanks to the side-focus adjustment knob. This is what Nikon touts on the product’s packaging, but around 3.7‘’ to 4‘’ would be closer to the truth. Still, this is a pretty decent clearance which ensures the safety of your brow, even when you’re shooting from a recoil-prone weapon. Besides being nitrogen filled and O-ring sealed (for waterproofing, fog-proofing and shock-proofing), the scope’s main tube is one-piece, which gives it excellent durability and stability. The scope comes with its own M308 mount, a single piece base that has rings directly machined to it. The base has an integrated 20 MOA, a great feature if you plan to shoot at extreme ranges and don’t want to run out of legroom for adjusting the elevation. The M308 rifle scope is covered by a limited lifetime warranty from Nikon Optics that guarantees replacement / repair of the product, free of charge, if it is found to have a flaw in its material or construction, during its entire lifetime. Being a specialized, professional grade rifle scope, the M308 doesn’t come cheap; so you should make sure you’re committed to the particular caliber and rifle before investing in it. A scope that is customized to a particular bullet type and velocity is great, but if you’re looking for something that’s a bit more generic, have a gander at the Nikon ProStaff 4-12x 40. It’s a fine entry level riflescope with a BDC reticle, so you can give it a try before moving on to more specialized products such as the expensive P and M series models. 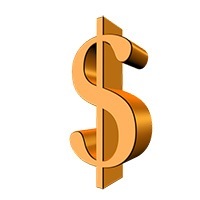 This way, even if you find the BDC reticle too awkward for your liking, you won’t have emptied your pockets for nothing. The .308 WIN is a highly versatile caliber that has proven its effectiveness against the much longer 30-06. Be it a conventional hunting rifle you’re using it with, or an AR-10, you’ll find that it gets that much more deadly when paired with the right scope.